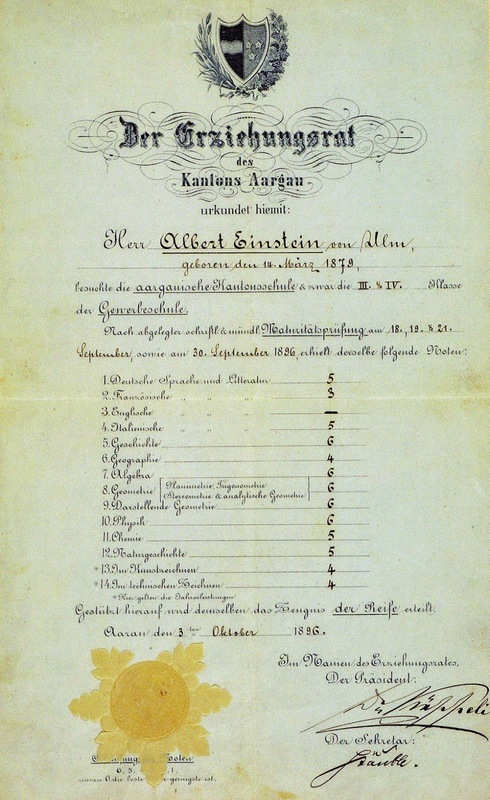 Albert Einstein’s matriculation certificate, aged 17, 1896. It’s a myth that Einstein was bad at math. This puts to rest that urban legend that Einstein was a “bad student”, although he received a three in French. He did, apparently, receive straight sixes in algebra, geometry, physics, and – history! Young Einstein knew what was important, it seems. Perhaps the legend is founded in the fact that the Swiss school system has a 6 as best grade, and 1 as poorest, while the German is the other way round. In his certificate of qualification for university matriculation the lessons which he was less interested in can easily be detected. But the average grade in his certificate was a 5, i.e. the grade “good”. In 1895, at the age of sixteen, Einstein sat the entrance examinations for the Swiss Federal Polytechnic in Zürich (later the Eidgenössische Technische Hochschule ETH). He obtained the best results in the mathematical and natural science subjects, but in the linguistic and historical subjects his achievements were unsatisfactory. His overall result was rated as insufficient. On the advice of the Principal of the Polytechnic, he attended the Aargau Cantonal School in Aarau, Switzerland, in 1895–96 to complete his secondary schooling. In September 1896, he passed the Swiss Matura with mostly good grades, including a top grade of 6 in physics and mathematical subjects, on a scale of 1-6, and, though only seventeen, enrolled in the four-year mathematics and physics teaching diploma program at the Zürich Polytechnic. The Swiss A-levels are called “Matur”; it corresponds to the German “Abitur”. Furthermore it has to be noticed that the assessment scale for school performance (school grades) in Germany and in Switzerland differs from each other, i.e. the grade 1 (excellent) in Germany equals grade 6 in Switzerland; the grade 2 (good) equals grade 5, etc. In 1935, a rabbi in Princeton showed him a clipping of the Ripley’s column with the headline “Greatest living mathematician failed in mathematics”. Einstein laughed. “I never failed in mathematics”, he replied, correctly. “Before I was fifteen I had mastered differential and integral calculus”. In primary school, he was at the top of his class and “far above the school requirements” in math. By age 12, his sister recalled, “he already had a predilection for solving complicated problems in applied arithmetic”, and he decided to see if he could jump ahead by learning geometry and algebra on his own. His parents bought him the textbooks in advance so that he could master them over summer vacation. Not only did he learn the proofs in the books, he also tackled the new theories by trying to prove them on his own. He even came up on his own with a way to prove the Pythagorean theory. Mr. Albert Einstein of Ulm, born 14 March 1879, attended the Cantonal School of Aargau, namely, the IIIrd and IVth class of the Commercial School. Based thereon he is issued the certificate of maturity. is french so hard to learn ? Its about interest not being hard. The article referenced it clearly. Yes, if we assume he was German. I conclude that the people commenting on this article are not very smart. You people don't realise that the German grading system is totally different: 6 is the lowest possible grade, 5 is when you just understand the basics of a subject, 4 is the lowest passing grade, 3 is the average grade, 2 is above average, and 1 is like A in the USA, and 10 in some other countries, in other words, it's the best grade in the German grading system. What we learn from this ? Einstein was bad at Algebra, Geometry and History. disciplines entirely, such as game and figures theory. Mathematicians also take part in pure mathematics, or mathematics because of its own sake, with no any application at heart. clean mathematics, and practical applications for what commenced as pure mathematics are often discovered.